Be the first to share your favorite memory, photo or story of Dr. William. This memorial page is dedicated for family, friends and future generations to celebrate the life of their loved one. 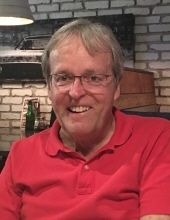 MOILANEN, Dr. William Robert - Age 68, of Fenton, died Wednesday, March 13, 2019. Funeral Mass will be celebrated 11:00 AM Monday, March 18, 2019 at St. John the Evangelist Catholic Church, 600 N. Adelaide St, Fenton. Fr. David Harvey celebrant. Visitation will be held at the church Monday from 10 AM until the time of the Mass. Those desiring may make contributions to the Michigan Parkinson's Foundation. Bill was born July 29, 1950 in Detroit, the son of Eino and Dorothy (Burkhardt) Moilanen. He was a graduate of St. Agatha Catholic School in Detroit; received his undergraduate degree from the University of Michigan; and his Doctorate of Dental Surgery from University of Detroit. He owned and operated Lake Fenton Implant and Family Dentistry in Fenton for nearly 40 years. Bill was a member of St. John the Evangelist Catholic Church and Kappa Sigma Fraternity. He also was a member and past president of the Fenton Rotary Club; where he would go on medical trips through Helps International to Guatemala. Surviving are: 3 children, Kristin Moilanen (Jan Erik Stroem) of Morgantown, WV, William Burton Moilanen (Erica) of Des Plaines, IL, and Daniel Burton Moilanen (Lauralyn McIntosh) of Flint; grandchildren, Annika, Nils, and Willa; brother, Larry Moilanen (Sandy) of Hermansville, MI; nephews, Weston Moilanen (Jill) of Holland, MI, Luke Moilanen of Port Angeles, WA, and Stephen Moilanen of Grant, MI. To send flowers or a remembrance gift to the family of Dr. William Robert Moilanen, please visit our Tribute Store. "Email Address" would like to share the life celebration of Dr. William Robert Moilanen. Click on the "link" to go to share a favorite memory or leave a condolence message for the family.